Make Learning Visible! provides up to 10 hours of new KIBO activities based on the Marker Extension Set. 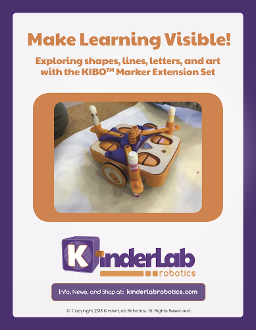 This research-based curriculum booklet supports the KIBO Marker Extension Set with engineering, mathematics, literacy, and art connections. Students will program KIBO to draw shapes and letters; create abstract artworks; and estimate distances by measuring the lines KIBO draws as it explores a cardboard town.